Kairavini karaiyinile - திரு அல்லிக்கேணி குளக்கரையோரம்: Vijayadasami Parvettai of Namperumal & Vanni tree. Vijayadasami Parvettai of Namperumal & Vanni tree. I had earlier posted about “Vijayadasami Parvettai” at Thiruvallikkeni. I had also written about the ‘vanni’ tree and had related the legend of Arjunan placing his bows and arrows in the vanni tree during the ‘exile of Pandavas’ and their “Ajnathavasa (living in disguise)” at Virada kingdom. Today there is an interesting article in “The Hindu” (Friday, 14th Oct 2011) detailing Namperumal’s purappadu to “Kattazhagiya Singar Perumal Koil” and enactment of the killing of demon ‘vanniyasura’ on the Vijayadasami day. Reproduced as it is from ‘The Hindu’. You can also follow the link Namperumal Parvettai to read that art article. Located just over a kilometre East of Ranganathaswamy temple in Srirangam is the Kaatazhagiya Singaperumal temple, one that pre-dates the Ranganatha temple when this kshetram was referred to as Velli Thirumutham. Only much later, after the construction of the Ranganatha temple did this place come to be called as Thiruvarangam. The Singaperumal temple was built by Vallabhadeva Pandya and has an imposing vimanam. Later in the 15th Century AD, Chakra Raya colonised the precincts of the shrine of Kaatazhagiya Singar and renovated the shrine. The maha mandapam, at the Singar temple, has pillars in Vijayanagar style. As this kshetram was a dense forest, surrounded by the two rivers - Cauvery in the South and Coloroon in the North - and inhabited only by the rishis and their families, the temple came to be called ‘Kaatazhagiya Singaperumal' temple. The story goes that wild animals constantly attacked the families of the rishis and consumed them. While the rishis, through severe penance, had the power to burn the animals just by their looks, they sought not to forego the fruits of their penance by killing these wild animals. Instead, they undertook a more severe form of penance invoking the blessings of Lord Narasimha. Pleased with their prayers, Lord Narasimha appeared before these rishis. As per their request, he stayed here with Goddess Lakshmi protecting the lives of all those who offered their sincere prayers at this place. Chaturbhuja Narasimha is seen with his two upper hands holding a conch and chakra while his lower hand is in an abhaya posture. Goddess Lakshmi with buds in her hands, is seen seated on the left lap of Narasimha. Interestingly, both the feet of Goddess Lakshmi can be seen at this temple. Old time residents say that this place was very much like a forest till the early 1970s. It is only in the past three decades that there has been development around the Kaatazhagiya Singar temple. This year at 6.30 a.m., on Vijayadasami day (Oct. 6), Namperumal, the utsava deity of Lord Ranganatha left on his palanquin on a three-hour procession through the ‘Eastern Vellai Gopuram' for his annual trip to the Kaattazhagiya Singar Temple for vijaya (conquest). Special Wooden boards were placed across the railway track to assist the Lord cross the Srirangam Station. On reaching the temple, Namperumal stationed himself at the outer mandapam where pujas were performed. In the evening, cane bows and arrows with brass heads were ceremoniously brought on an elephant back via the Chitra streets of Srirangam. At six p.m., Namperumal on his Golden Horse mount had been brought earlier in the day from the Ranganatha temple and was positioned at the four pillared mandapam right in front of the Vanni tree for the much awaited event. 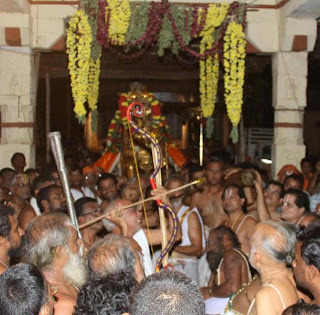 After performing puja at the Vanni tree, the hunting scene was enacted in front of thousands of devotees who had gathered at the Singaperumal temple with Namperumal's representatives striking the arrows in different directions signifying the killing of Vanniyasura, the forest demon and symbolically suggesting the protection of the good. After the enactment of this hunting scene and having spent the whole day with the ‘Narasimha of the Jungle,' Namperumal bid good bye to Kaatazhagiya Singaperumal for yet another year and started on his return trip at around 7 p.m.
Kaatazhagiya Singar Temple is about 200 yards east of the Srirangam railway station. Auto drivers, from Ranganathaswamy temple (South/North entrance), could charge Rs.30-40.